The angels sang out the sweetest words known to heaven; those satiny utterances blended in a viscous glistening glaze of honeyed grace notes, dripped down through the sacred skies absorbing the creamy confection of divinity, the result was blended with brown sugar, syrup, butter, vanilla and cream…and the angels called it CARAMEL. The graduation announcements, which I ordered with great enthusiasm and anticipation, arrived carefully boxed and protected in plastic. I gingerly removed the various wrappings, sat down at my table with my best black pen and the carefully-crafted list of 25 deeply-cherished friends and family members, then mailed out each invitation with a wish that the recipient would share my joy as completely and heart-soaringly as I was sharing the news of my successful attainment of a B.A. in Liberal Studies. Graduation was over a week ago and last night I found myself wondering where each of the 25 announcements is now. Surely my beloved mother has hers either still posted to the front of her refrigerator (where I’d asked her to hang it, in the spirit of “look what my kid did”), or carefully boxed with her other treasures. And I spoke with my doctor last week — she told me that she immediately put hers on display on a shelf in her office, where it remains. But, people’s time and lives being cluttered enough with their own priorities, I’m certain that the vast majority of my announcements ended up either being recycled along with the empty Pale Ale bottles and Barilla pasta boxes, or shoved in a garbage can — noodles and fish scraps sliding down the Sonoma State University Official Seal. That’s the way of life: we move on. Jerry Seinfeld, demonstrating his usual keen cultural understanding, wrote into one of his episodes a bit in which a girl he’s seeing (but not that crazy about) gets annoyed with him because she spots in his trash can the card she had sent him, leading him to question just how many days one is obligated to keep greeting cards before being allowed to dispose of them. He’s brilliant. Because I have the feeling that the more affection people feel for me, the longer they are inclined to hold on to that announcement. Have you ever received a card from someone, opened it, and thrown it directly into the trash? It’s the Greeting Card Lifespan Measure of Meaningful Relationship. If you’re reading this, and you received one of my announcements, my hope is that the announcement made you smile, that you kept it around for at least a week so you could smile a few more times, and then either tucked it away (if you have space/inclination), or responsibly recycled it so that it could have new life. Because if recycled, then, much like the graduates themselves, the announcements become reborn as blank sheets of paper upon which new excitements, new invitations, and new worlds of opportunity can be printed and invented. I can’t think of a more perfect commencement — for people or paper. It was called Swivel Hips. 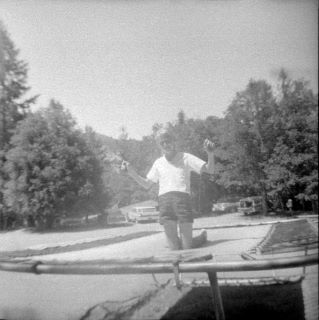 It was a particular trampoline maneuver and, in all the years I attended Camp Fire Girls’ Camp Seabow as a young girl, successfully executing a perfect Swivel Hips remained one of my highest priorities — right up there with cadging an extra cup of hot cocoa when Cookie stepped out of the Mess Hall. To do a Swivel Hips, you jump fairly high, do a seat drop with your legs straight out in front, then in one graceful and exhilarating motion, while swinging both arms high to provide momentum, you “…bounce up to a straight position (without landing) and then perform a half twist and land in the second seat drop facing in the opposite direction” (Wikipedia). Done right, it’s like dancing on air. When I did Swivel Hips, I was surrounded by the happy faces of my friends and a more silent but majestic audience: the tall, fragrant pines of the mountains north of Laytonville, California. Jumping on the trampoline in Seabow’s meadow, protected by fellow campers while encircled by deep green forest was freedom and joy and intoxication like I’ve never known since. I hadn’t thought of Swivel Hips in years but today, while taking my walk, I heard a caller to KGO’s legal advice program explain that his child had been invited to a trampoline party, and that the parents were being asked to sign release-of-liability forms before the hosts would let their children jump. I know that contemporary trampolines are enclosed by a tall barrier of netting. Our camp trampolines weren’t caged in; instead, we were trained as spotters, and each of us stood at strategic places at the perimeter while the jumper performed. Listening to the caller, I pictured little 21st century Sophias and Noahs in line for their turn, stepping up to the safety-wrapped equipment, and dutifully handing a waiver to the solemn gatekeeper, who checks for proper notarization before admitting each child to the cage. While it’s likely my parents had to sign some sort of waiver when I went to camp, it certainly wasn’t equipment-specific, as I’m sure the Camp Director didn’t consider the trampoline any more of a threat to us than the lava-hot melted marshmallows we pulled from our skewers while making S’mores around the campfire (not to mention the nasty-tempered wild boars which freely roamed those hills and often wandered into camp). And in all the years I attended Seabow, not one girl was ever injured. Don’t get me wrong; I understand “better safe than sorry.” And I’m not making a case for the sort of 1950s recklessness which led to a generation of children riding in cars without seatbelts. But we do need some sort of happy medium. It is better to be safe than sorry — but please let’s not raise our children to be safe and sorry. Because I’m deeply thankful I never had to practice Swivel Hips in a cage, surrounded by protective blue netting instead of gazing into my friends’ “you can do it!” faces. It just wouldn’t have been the same.